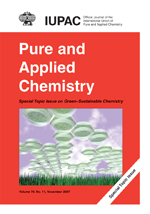 This Special Topic Issue on green chemistry is a continuation of the Special Topic Issue published in July 2000. The articles have been selected (with great difficulty) from the massive, valuable scientific contributions on green chemistry made by numerous professors and researchers during the first International IUPAC Conference on Green-Sustainable Chemistry, held 10–15 September 2006 (for more details on the conference, see May-June 2007 CI). All of the articles point out a general need for novel green processes and recommend that process and product evaluations include environmental and health considerations (Sep-Oct 2007 CI). To accomplish that, more basic research on chemical reactions related to green chemistry is essential. Our knowledge in this area is far from complete. Recently, in fact, the difference between sustainable chemistry and green chemistry is becoming more evident. Sustainable chemistry envisions industrial processes that create better products, result in fewer pollutants, and are profitable. Green chemistry, in contrast, is more innovative. It deals with the fundamental aspects of chemistry without regard for industrial processes or profitability. Either way round, over time, it will become more and more necessary to create a new type of chemistry that utilizes greener production methods, involves cleaner chemical derivatives, and addresses some of the ethical issues related to environmental responsibility. This special issue of PAC addresses this need.